With the LR18 Alcons expands its line-array range with a medium sized model that is positioned between the compact models LR7, LR14, LR16 on one hand and the large touring system LR28 on the other hand. The German magazine Production Partner tested the LR18 pro-ribbon line-array. Resident in the Dutch town of Zwaag, Alcons Audio was founded in 2002 and since then has been continuously expanding its speaker range. This includes line arrays in all sizes, classic point-source speakers and a complete line of subwoofers. The unique feature of almost all Alcons Audio speakers is the high power (pro-)ribbon tweeter, which is built at Alcons in sizes from 4" to 18". Since the complete development and manufacturing takes place in Zwaag by Alcons, the ribbon tweeter can be designed and produced to the desired length for the specific configuration. The system featured in this test is the brand new LR18 line-array. As always, the individual paths of the system were measured in the laboratory, first straight without crossover, with which the performance of a system can be judged best. The LR18 is equipped with a 7"-ribbon tweeter with 90°-waveformer for the horizontal plane, a 6.5" midrange driver and two 8" woofers. 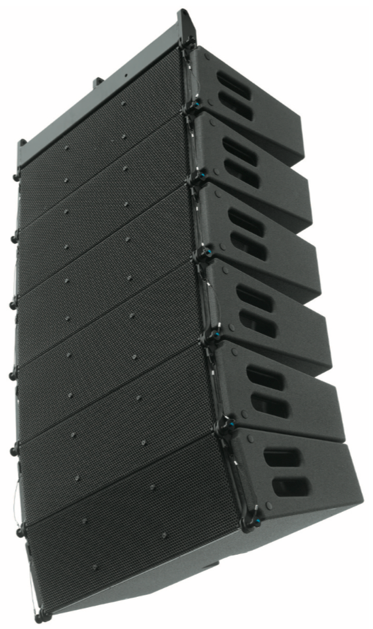 This compact medium-sized line-array is right on time to fulfil the market’s greatest demand. The coaxial arrangement of the ribbon tweeter with a 6.5" cone-driver in a bandpass chamber is one of the new features whereby a completely symmetrical three-way arrangement was made possible. In the horizontal plane an almost perfect dispersion is achieved thanks to smart filtering between the three ways. The advantages of the ribbon concept for line array and the distortion values are already widely recognized, just as you would already know from the LR28. Despite the three ways, the LR18 economically only requires two amplifier channels, with a passive crossover between MF and HF.